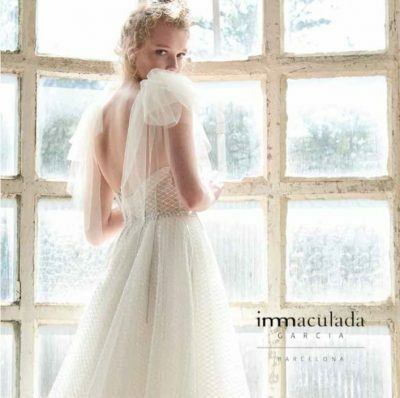 From 23rd to 29th April Now in its 28th edition, Barcelona Bridal Fashion Week has established itself as the international benchmark for bridal fashion. The event showcases more than 370 brands, 68% of them from 28 different countries. This year, the fair has increased the number of exhibiting brands by 20%, beating its previous record. The fair, organised by Fira de Barcelona, has become one of the main events in the bridal fashion sector due to the presence of buyers from 50 countries and leading national and international labels. The runway will be showing the collections of 27 labels, including Spain’s leadings designers, such as Inmaculada García and Jesús Peiró. We are extremely honoured because both brands are part of Turisme de Barcelona’s Barcelona Weddings programme, which has been created to promote Barcelona as a wedding destination. Since it was launched, the programme has been firmly committed to including local bridal fashion designers. Inmaculada García and Jesús Peiró bear witness to the city’s time-honoured textile tradition and are great ambassadors for hand-made Barcelona design. Mediterranean, welcoming, fun, multicultural, accessible, modern and elegant, Barcelona has become a much-dreamt of wedding destination, where buying a bridal gown can be part of a great experience. Fashion shows, international prizes, like the 2018 Elle International Bridal Awards, and a whole host of other activities, will fill Barcelona with fashion. During the fair, you’ll be able to enjoy runway shows and other events at some of the city’s most iconic locations, such the Italian Pavilion on Montjuïc, the Sant Pau Art Nouveau Site, Barcelona’s Maritime Museum and Barcelona University.